Came in last night at 1am from Texas and it was 40 degrees and raining. Told michaela to take the sportcross to work the next day because I knew how to baby the clutch in the Mazda to keep it from somehow blowing up completely and stranding her somewhere. Well turns out all that rain froze into a huge sheet of ice on the highway she takes to work. I counted 24 or 25 cars off the sides of the road. 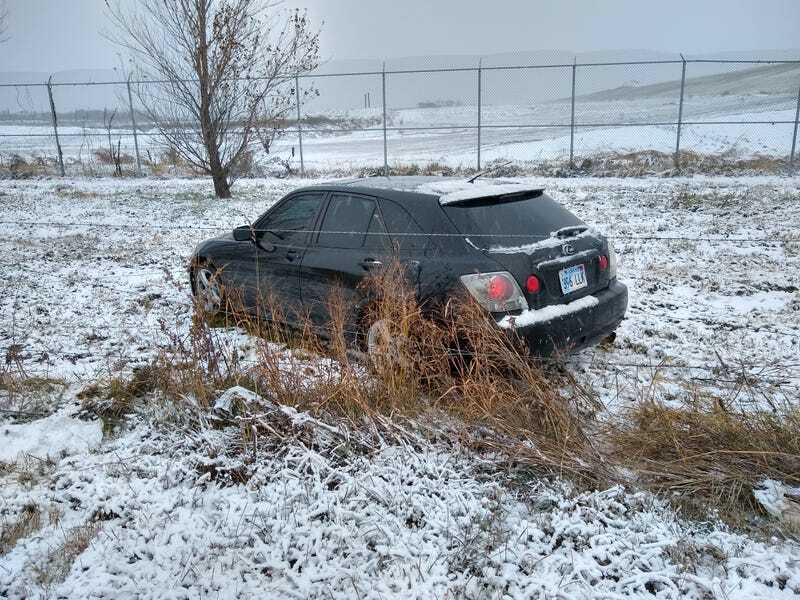 The road was slippery enough that if you parked on the shoulder the car would slide sideways. One dude did a 360 in front of me in a Ford Escape at 20mph. Cleared up within an hour though. Waiting to hear back from insurance. Two at-faults within a month is gonna be gr8. It’s probably gonna need a new front bumper hood and fender. Headlights seem okay. Haven’t driven it due to the barbed wire wrapped around the suspension but the alignment is probably all wack.